Wow, what a day! My humans finally took me with them on their play toy called a kayak. The truck was loaded the night before so we went right to the truck and were on the road before the sun was shining. Since five in the morining is my hyper time I was wired and ready to go. As we were driving I explored the truck. There were many new things to me, so it was bound to be a fun day. When we arrived I went into my kennel, so they could get all the stuff out of the truck, and after much anticipation they let me out to wander around for some exercise. So many new things to see and smell, that my nose, eyes, and ears could not stop moving. I was confused when they threw their favorite toy, the kayak, into the water. 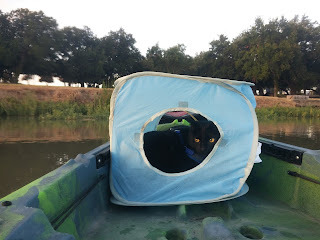 While I was walking around my human picked me up and put me into the kayak, I was not sure what they were doing at first, so I held on with all four paws. Water is fun but I had never seen, or been near this much water. It was strange to walk around on the kayak since it was always moving. After some time I started to feel comfortable and began exploring the kayak all the way from the front to the back. The kayak could move fast, slow, forward, backward, and in all different directions. When my female human came near I decided to jump on to her kayak. That is when I learned this may actully be fun after all. 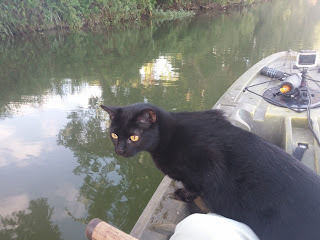 Getting back into my male human's kayak it was much harder and my back paws actually fell into the water. I was not scared. Long after the sun came up I decided that it was nap time, since I ususally nap after my human goes to work it was long past my usual nap time. My humans were kind enough to create a place that was out of the sun so I would not get too hot. All during my nap new smells would come with the wind and get my attention. From the begining to the end of the day there were always new things to smell and see. At some time during the moring we came across some rocks and I decided it was time to get out of the kayak. They were not very big rocks so it was not long before we were moving again. My humans kept throwing toys from the kayak on a string, only to bring them back in again. But twice the toy they threw out of the kayak had a funny animal on the end of it that tried to steal their toy. They let me smell it, but by that point I was just too tired to do anything but smell the animal. 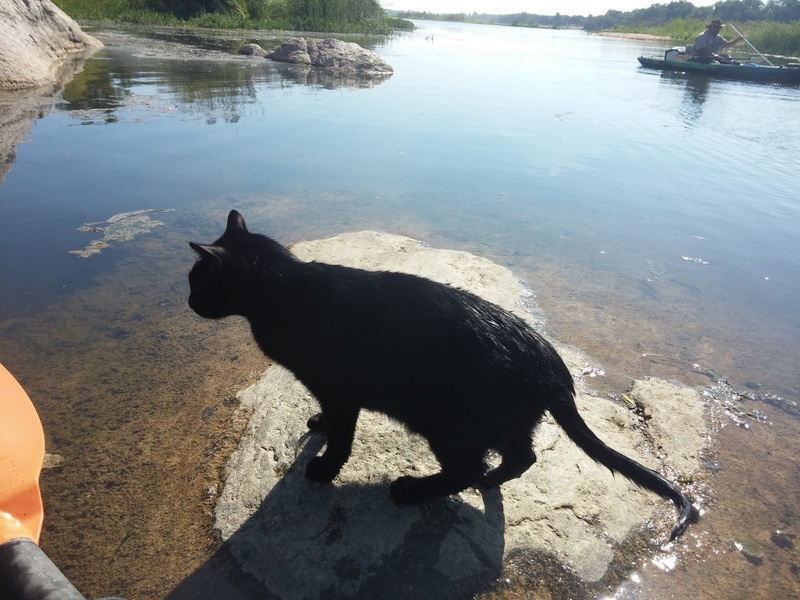 So, I went back to my nap as my humans were putting the animal back into the water. Lunch time was a nice break from the kayak. It was back to land and the shade of the trees on the place my humans called an island. We all took a swim to cool off and after a few times of swimming between my two humans I decided this was acceptable as long as my mouth was above water, and it was sooooo much cooler than being in the sun on the kayak. 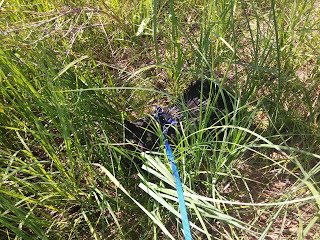 While my humans ate, I finally got to nap, but falcons were flying overhead and I decided to go just a little further under the brush to protect myself. 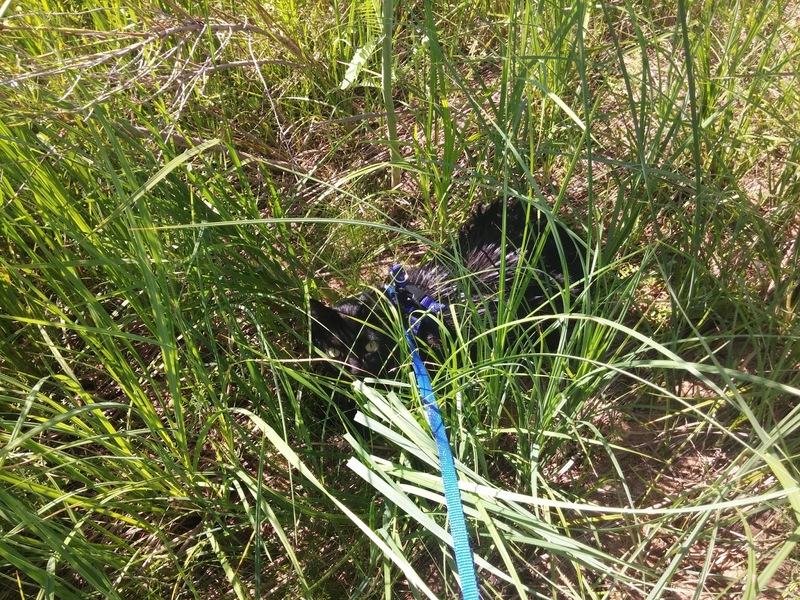 My leash was attached to a tree, so it did not take much effort to move. After a while my humans started calling me, but I knew where I was and they were not very far away. It was perfect conditions for napping, so I drifted off to sleep. My humans walked all over the island calling me, but my nap was more important. As I awoke they were both standing above me, looking at me and I could not figure out what all the fuss was about. There was one last swim in the river before we got back into the kayak heading to the truck again. 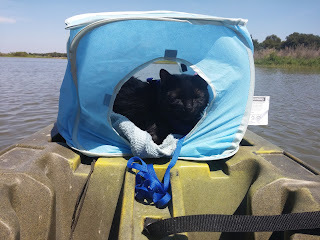 It was a slow, bumpy ride back to the truck since the wind had begun to blow and the humans were still throwing their toys into the water to get more of those flopping annimals to bite the end. Silly humans. At the very end of the day we were greeted by a bunch of humans laughing and having fun in the water much like I did, but all I wanted to do was sleep, so when my human put me back in the kennel that is exactly what I did. It was a calm peaceful sleep all the way home. Today was a great adventure and I hope they take me again, but I was glad to be home.